A truck farm was a farm that produced vegetables to be sold at the market. Crops grown on truck farms included tomatoes, melons, onions, strawberries, citrus fruit, potatoes, and green vegetables. How does geography impact local economies? Describe the scene in the photograph and explain the process by which farmers were able to sell their produce. 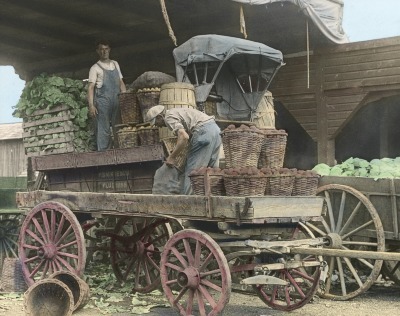 Men loading potatoes and cabbages onto a wagon at a truck farm near the town of Jamaica, Long Island, New York, 1916. What are the men doing in the photograph? Science: Investigate the nutritional benefits of the types of foods offered by the truck farms. English Language Arts: You are the owner of a truck farm. Create a poster that would persuade people to buy items from your truck farm.